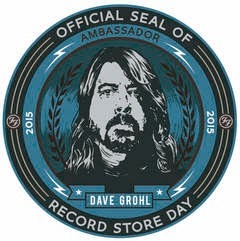 Discussions Magazine Music Blog: The RECORD STORE DAY 2015 Ambassador is... DAVE GROHL! The RECORD STORE DAY 2015 Ambassador is... DAVE GROHL! The party in 2015 will once again cement Record Store Day’s legacy as the music industry’s biggest holiday, celebrating the culture of the independent record store worldwide on Saturday, April 18th. “I found my calling in the back bin of a dark, dusty record store. 1975's K-Tel's Blockbuster 20 Original Hits by the original Stars featuring Alice Cooper, War, Kool and the Gang, Average White Band and many more, bought at a small record shop in my suburban Virginia neighborhood, it was this record that changed my life and made me want to become a musician. The second that I heard Edgar Winter's "Frankenstein" kick in, I was hooked. My life had been changed forever. This was the first day of the rest of my life. More recently, I’ve been fortunate enough to have the opportunity to rediscover this sense of excitement, that magical feeling of finding something all one’s own, by watching my kids go through it. Watching them realize how crucial and intertwined every part of this experience is, I relive the magic of my earliest experiences with vinyl singles and albums, their artwork, liners notes etc. all over again and again. Ambassador Grohl will also be participating in Record Store Day by releasing SONGS FROM THE LAUNDRY ROOM, a 10” four-track EP featuring previously unreleased Foo Fighters demos, covers and songs. The Official List of Record Store Day Releases will be announced at a press conference at Rough Trade in Brooklyn on Tuesday, March 10th. Record Store Day is managed by the Department of Record Stores and is organized in partnership with the Alliance of Independent Media Stores (AIMS), the Coalition of Independent Music Stores (CIMS) and celebrates the culture of independent record stores by playing host to in-store events/performances, signings and special product releases on a global scale.